Kyoto, the old capital of Japan, a poetic city of tradition and history. Famous for its sightseeing and temples, a city that you must visit during the hauntingly beautiful Hanami season. Besides the magnificent traditional architecture, the famous district of Gion, the delicious wagashi or the Geisha entertainment; There is one hidden gem that you must not miss in Kyoto: The Fire Ramen experience at Menbakaichidai. A unique show, where the only thing more impressive than the flames you will see is the taste of their delicious smokey Fire Ramen. Menbakaichidai Fire Ramen is located at walking distance from the Nijo Castle and the Imperial Palace, which means that you have no excuses not to pay them a visit. In fact, it is the perfect refuel stop after a long walk in Kyoto. Do not be discouraged by the no booking policy, this place isn’t known by the majority of the tourists yet and they have a quick turnaround time. Now let’s talk about the experience! I arrived at Menbakaichidai around midday after visiting the Nijo Castle. A few people were queuing outside and we had to wait 15 minutes before being seated. The restaurant has capacity for eight persons at a time with counter seats only. 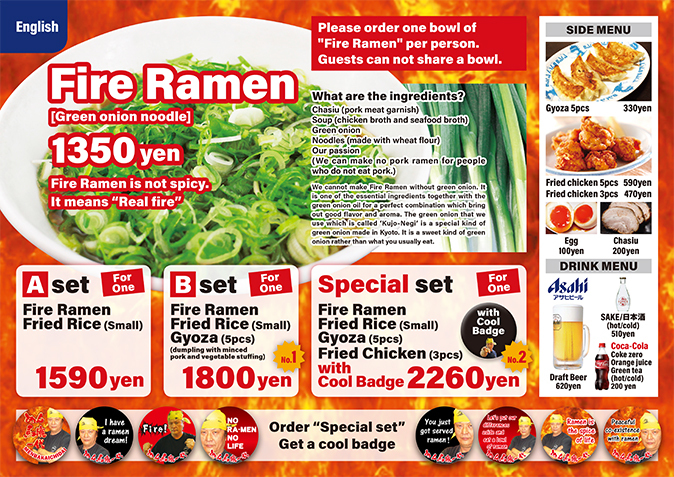 The menu is quite simple (details below) with 3 different choices of set all based on the Fire Ramen. Once you have ordered (i went for the B set), the staff will explain to you the rules of safety and they will give you a paper bib to protect your clothes from the oil. Also, they will make sure to clear any apprehension you might have and make you feel comfortable the whole time. The place is super Social Media friendly; They have put in place, behind the counter, several selfie sticks for all the guests. The Chef will ask you if you want him to hook your phone or camera and record the whole experience (how cool is that?). You will find below a video of the experience that i have recorded when visiting Fire Ramen Menbakaichida. Needless to say that it is quite impressive, and really worth a detour! After the experience, the super amiable staff make sure to chat with everyone (they speak a bit of English) to understand what you are doing, what you intend to visit and they will give you great tips of the place to see in Kyoto. When you see the staff preparing your ramen proudly wearing a T-shirt No Ramen No Life, you know it is getting serious. Fire Ramen Menbakaichidai is not about the fire show only, it is also about the Ramen itself. The ramen has a soy-based broth with a special blend soup of chicken, pork, and fish. Concerning the toppings, forget about your usual Nori (seaweed), Menma (bamboo) or Beni Shoga (Pickled Ginger), the Fire Ramen is rather minimalist. It is mainly topped with a lot of Green onion and Chashu; In fact, there is a reason for that. The Fire Ramen has been elaborated around the Fire experience. The idea is to provide a unique smoky flavour thanks to the cooking process and the ingredients used. The green onion used is a local onion produced in Kyoto and called Kujo Negi. This onion is largely used in this recipe to enhance the smoky and savoury flavour of the Ramen once the burning oil is poured on top of it. The Fire Ramen won’t blow your mind as it happened to me with the Black Truffle Ramen served at Tsuta Tokyo, but it remains a very pleasant experience. Once the burning oil is poured onto the Ramen it is advised to eat straightaway (don’t worry it is not burning hot!). The first sip of broth will surprise you with the super smoky flavour. It is not that often that you can taste a Ramen broth like this one! The thin noodles are pretty good and complement well the Ramen. The Chashu is also delicious and his flavour really benefits from the burning oil. The fried rice and Gyoza served on the side with the B set are also both pretty decent. Needless to say that i had a really good time and left the place full, with a smile on my face. What else could you ask for? “Fire Ramen MENBAKAICHIDAI is an amazing experience in the Heart of Kyoto. An impressive show and a delicious ramen delivered by a super friendly Staff.